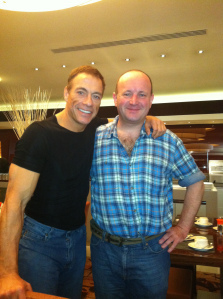 Amazing Stunt By Jean-Claude Van Damme… Me & JCVD! It was on tour with the Royal Liverpool Philharmonic Orchestra in Bucharest, Romania, 2011, that I met Hollywood Superstar, Jean-Claude Van Damme. I sat by him at breakfast in the five star Radisson Blu Hotel and he proved to be both witty and charming company. The RLPO were appearing at the Enescu Festival and ‘The Muscles From Brussells’, as he is known, was based there for a new blockbuster film, ‘Six Bullets’ aka ‘The Butcher’. Jean-Claude Van Damme and I. This time it’s personal! This entry was posted in About Brendan Ball and tagged 'RLPO', actor, ad, advert, advertisement, ball, biography, Blog, blu, brendan, brussells, claude, damme, enescu, epic, feat, Festival, from, hollywood, image, jcvd, jean, life, liverpool, muscles, orchestra, philharmonic, photo, radisson, Romania, royal, seeing, sight, split, splits, steering, stunt, tour, trucks, van, volvo. Bookmark the permalink.